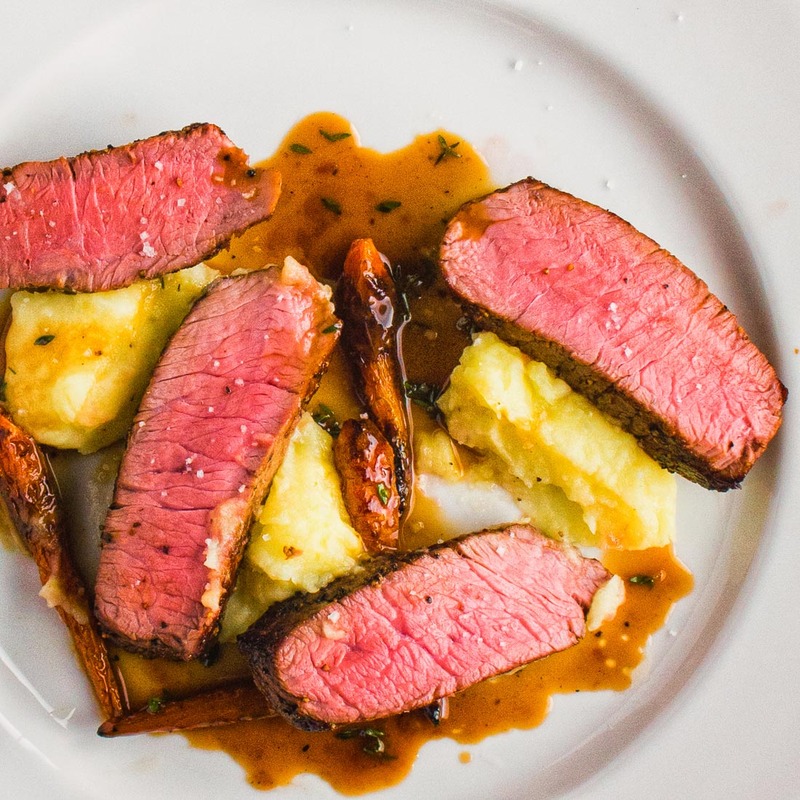 Steak with thyme white wine reduction. 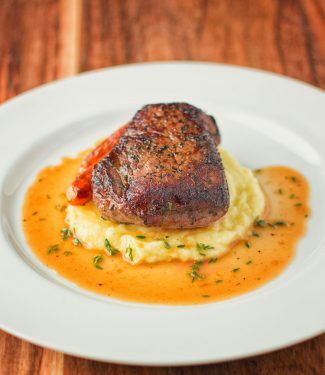 A nice pan-fried steak perched on a smear of truffled mashed potatoes with a drizzle of thyme infused sauce all around. A dish fit for virtually any occasion. Fine dining at home. This is a bit of a guideline recipe. You can go different ways with it. Blue-cheese mashed instead of truffled. Garlic mashed works too. 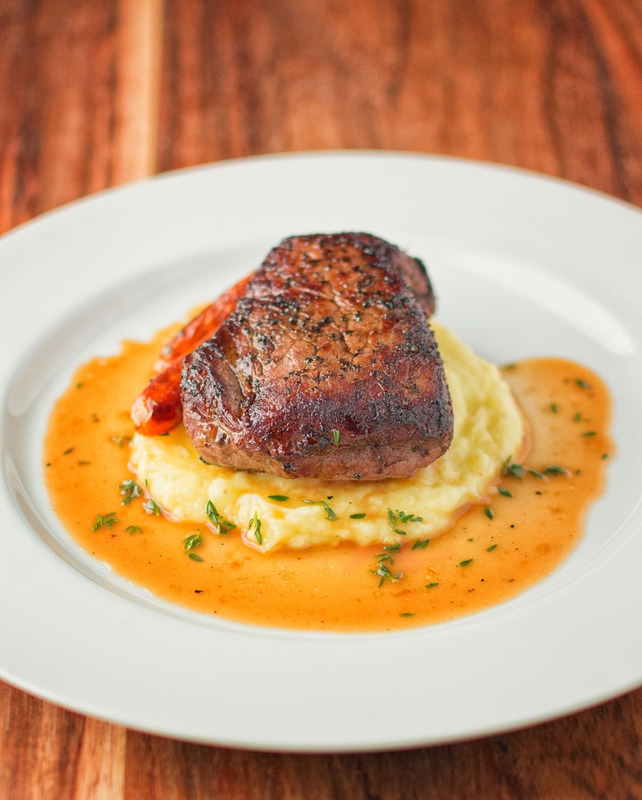 The baseline steak with thyme white wine reduction recipe can go a whole bunch of ways. How you like it. Don’t want mashed? Some potatoes roasted in duck fat would be spectacular. You can plate it different ways too. Place the whole steak on top of the potatoes or slice it and nestle the steak between spoonfuls of mashed. Getting the truffle flavour into the dish is easier than you think. Fresh truffles – overkill for this recipe. Truffle salt works beautifully though. Truffle salt is salt with little bits of real truffle. It’s a great ingredient – sauces, potatoes, soup – lots. Last is truffle oil. Truffle oil doesn’t actually have anything to do with truffles. It’s pretty tasty though so use that if it’s all you can get. But do learn about truffles if you haven’t tried them yet. It’s a wonderful flavour. Just remember – truffle is a delicate flavour. It will fade as you cook it so add it last. This recipe works with chicken stock. It works better with veal stock. It works fantastically with concentrated veal stock. Think of chicken stock as one star. Veal stock pushes it to two stars. Concentrated veal stock gets you the third star. Depends how nice a restaurant you feel like turning your kitchen into tonight. Pan-fried steak with a white wine thyme reduction. Truffled mashed potatoes. 3 star dining at home. Boil the potatoes until tender. Tender means a fork inserted into the potato meets no resistance. Add the butter and heated milk. Use a ricer, masher or hand mixer - whatever you are comfortable with - to mash the potatoes. You are going for a puree texture here so add more milk if needed. Heat a solid frying pan over medium heat. Pan fry the steaks to desired doneness - somewhere around 4 minutes per side for medium rare. An instant read thermometer is the only reliable guideline here. Different steaks, different stoves, different pans - nobody can figure this out except you and your thermometer. Cook to 125F for rare, 135 for medium. Remove from pan and tent with foil. Spoon off fat from pan. Deglaze with the white wine and reduce the wine to 1/4 cup. Add chicken or veal stock and reduce by 1/2. Add the concentrated veal stock at this point if you are using it. If you don't have any please consider making some someday. It's flavour and mouthfeel dynamite. Add the fresh thyme leaves. Add the accumulated juices from the steaks and simmer for another minute. Season with truffle salt or add a drizzle of truffle oil and adjust salt to taste. Smear a few tablespoons of truffled mash in the centre of the plate. Top with steak. Drizzle sauce around. If you have it, a little sprinkle of fleur de sel to finish is a nice touch. Concentrated veal stock is a great thing to have on hand to push dishes over the top. It contributes both flavour and mouthfeel. In american, beef, french, main course, meat. Bookmark the permalink. I love a good pan-fried steak! And now that you said duck fat potatoes, I must have them now!! I’ve never made concentrated veal stock, but with your description, I think I have to give it a go. With duck fat potatoes and concentrated veal stock in your arsenal there will be no stopping you! Watch out! Hello beautiful. Did I just walk into a restaurant or is this still Romain’s blog? Damn, that looks good! Well that just makes my day! Thx! Thanks for the crash course on truffles, that is one ingredient I really know nothing about. This would be a perfect date night meal to make! If you’re into them, truffles are pretty much instantly addictive. If not, well, you’ll save a lot of money:-) If you do find you like them, truffle goes incredibly well with chicken as well. My husband would go absolutely crazy for this! I haven’t made a good steak in a while, but I am definitely going to now with your recipe! Your concentrated veal stock sounds so good. Where did you source your veal bones to make it? The concentrated veal stock is a great way to add serious depth to anything you’re cooking. I get my veal bones from my local butcher. Usually I call ahead to make sure they have them or can get them. This dish is gorgeous, Romain! The perfect date night dinner. I’m all about truffles, so I’m especially excited about these truffle mashed potatoes. Can’t wait to make this recipe! Thank you. Very kind. If you like truffles and you haven’t had truffled mashed potatoes I think you will be happy. Three star?? No way, five stars all the way! Thanks for the tip about adding truffles last, wouldn’t want to ruin ANY dish I decide to use them in! OK – 5 stars it is! Hope you enjoy using truffles. Good Lord – your plating. Can I come to dinner??? And the thyme-infused sauce sounds incredible. Now . . . to make this or your prime rib recipe for valentine’s day . . . ??? House across the street is for sale! Try truffle salt or truffle oil in a leek and potato soup. Absolutely sensational.